I’ll bet you a beer “fridge” tells you it’s Alder!!! Hell yeah. Alder. 100%. Maple alder to be exact. It looks like there are 2 different species. Maybe I took bad pictures. You think they are both alder? Not necessarily. Fridge always says it is alder when someone asks for wood identification. It is a confusing and worn out attempt at humor. He should be ignored. If you’re in South Jersey, it could be Toms River Alder. But I always get these wrong. 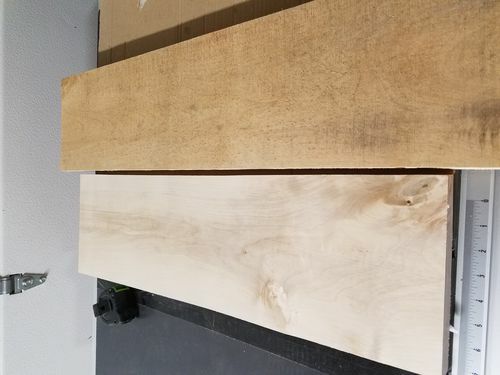 If not Alder, the light colored one looks like it could be Poplar. Either way, free lumber is always my favorite! They both look like Maple of some sort. Better pic’s (close ups) would help. One on the left….Cherry. 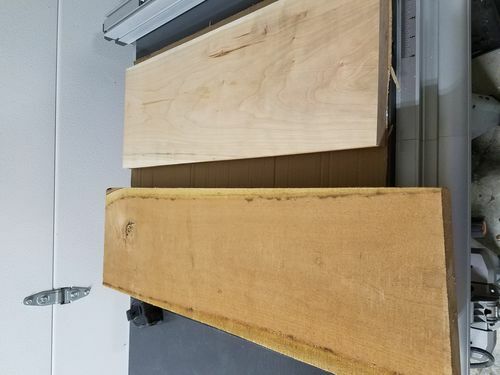 One on the right…..Maple. Give some credits guys. I said maple alder. You know eventually even a blind squirrel finds a nut. The odds are good. It is maple, likely red maple.